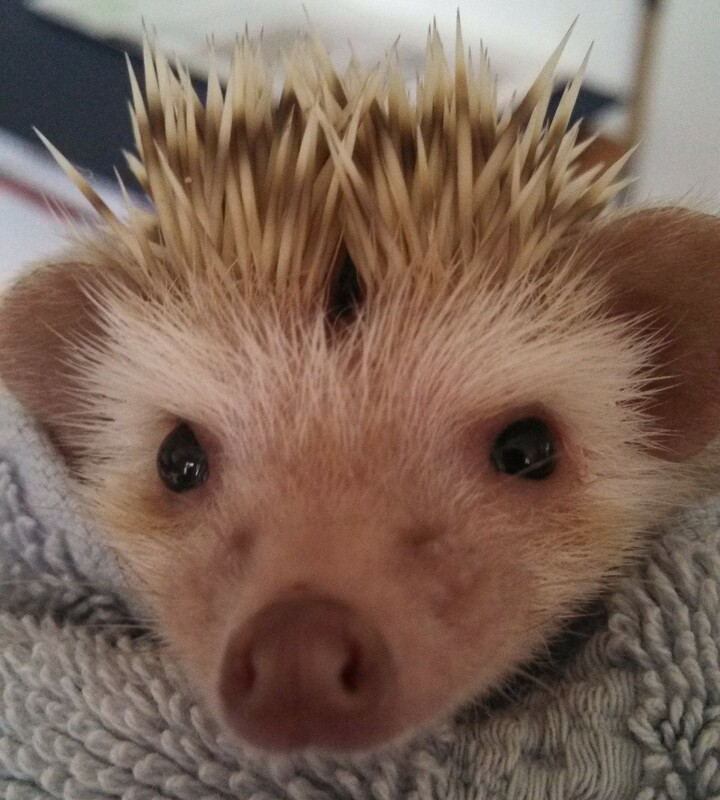 Pleasantries of Princess Pricklepants Ponderings, Perusings, Peregrinations of a Practically Perfect Hedgehog. Is a Hedgehog Right For You? So, you want to get a hedgehog. 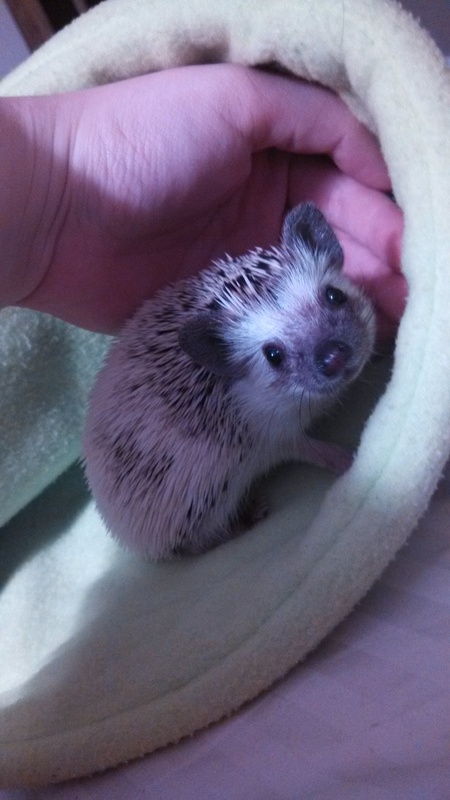 Our very first hedgehog, Púca. In the past few years hedgehogs have become a very popular pet. The internet is rife with videos of them doing everything from floating happily in a sink to enjoying tummy rubs from their owner. There are even photos of them camping, kayaking, and cheering the viewer on in hopes that they make the most of their day. Hedgehogs, in short, have become a bit of a fad. How accurate are the best known depictions of their behavior, though? How high is the likelihood of getting a pet that will happily don a shark-hoodie and delicately accept a slice of apple from your baby spoon? The first thing I ask a potential adopter is whether or not they have had experience with hedgehogs before. The vast majority of people who adopt from me have not, although many have had some exotic animal experience in the past. Whether rat, rabbit, or reptile the experience of owning a non-traditional pet does indeed help understand the complexities of dealing with a hedgehog. Hedgehogs are not nearly as difficult as some people assume they would be – for instance, unlike sugar gliders the cat food that comprises the bulk of their diet is easy to come by – but they do require a slightly different skill set than most animals do. None of this is to say that you need exotic animal experience prior to owning a hedgehog. It is just something that would make the transition easier. The second thing I ask a potential adopter is whether or not they have a sense of humor. Hedgehogs, you see, require just that: a good sense of humor. You have to be able to laugh through the difficult times of owning such an animal and not take too seriously the huffs, puffs, and prickles that they offer you. You have to be able to laugh when they become little more than a potato with toothpicks sticking out of it in your hand. Patience is also a virtue, of course, but a sense of humor will serve you better and longer when the bonding process stretches from days, to weeks, to potential months. I doubt many will face the uphill climb of two years that it took for me to find the sweetness inherent within my second hedgehog Sebastian, but it still is a possibility. Hedgehogs can be difficult, but that doesn’t mean that they aren’t worth the time and effort. The third thing required for owning a hedgehog is time. Time not in the sense that the hedgehog will dominate your every waking moment as a husky or a crow might, but rather in the sense that you must devote a certain amount of time to the hedgehog in order to socialize it successfully. Like most exotics, the hedgehogs sociability is based upon the amount of time you spend handling them confidently. The more used to your scent, touch, and voice that they are the calmer they will be around you and others. The less time you spend with them, the more their natural skittishness will overtake their curiosity. This is especially true of rescue hedgehogs who likely already have a history of minor neglect. Before deciding upon getting a hedgehog it is vital that you consider the time and effort that the creature will require. Is this a pet that you will enjoy, even if it huffs and hisses at you for the first week or month? Is this a pet you are confident enough to handle, and amused enough to not feel threatened by? Finally, are you going to put in the hour or so a day that they require to become well socialized? It is worth noting that socialization can be as simple as holding the animal in its snuggle sack while you are occupied with other things, but devoted time for play and enrichment is by no means a bad idea. Consider the above, and if it all still sounds delightful to you, then continue with the research and potentially go to meet some of these silly animals.